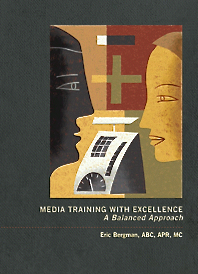 A number of years ago, the International Association of Business Communicators (IABC) published Media Training with Excellence: A Balanced Approach, a comprehensive “train-the-trainer” guide that teaches others how to develop and deliver effective media training. "This program refutes that view. It teaches that a spokesperson's job is to manage the interview to win-win outcomes," says Bergman. “To do that, spokespeople must first be taught to answer questions clearly and concisely, wherever and whenever possible. This not only protects them by providing less context from which misquotes can be drawn, it builds stronger working relationships with reporters." The first outlines the logic for having spokespeople answer questions clearly rather than attempting to "stay on message." The second provides insight into improving presentation, facilitation and coaching skills. The third describes how to conduct training sessions from start to finish, including how to lead participants through practice interviews and what to look for to provide feedback. When IABC exited the publishing business a few years ago, Eric reacquired rights to the program. Contact Eric if you’re interested in learning more.